ITMA’s Regional Director in North America, Dr. Donald Redelmeier recently published his work on BMJ to describe the relationship between the full moon and an increased risk of fatal motorcycle crashes. Although other potential confounders cannot be excluded from this relationship, it is worthy to be aware that motorcyclists are facing a higher risk of fatal crashes during a full moon. It is encouraged to ride with extra care under such a circumstance and appreciate the power of seemingly minor distractions at all times. 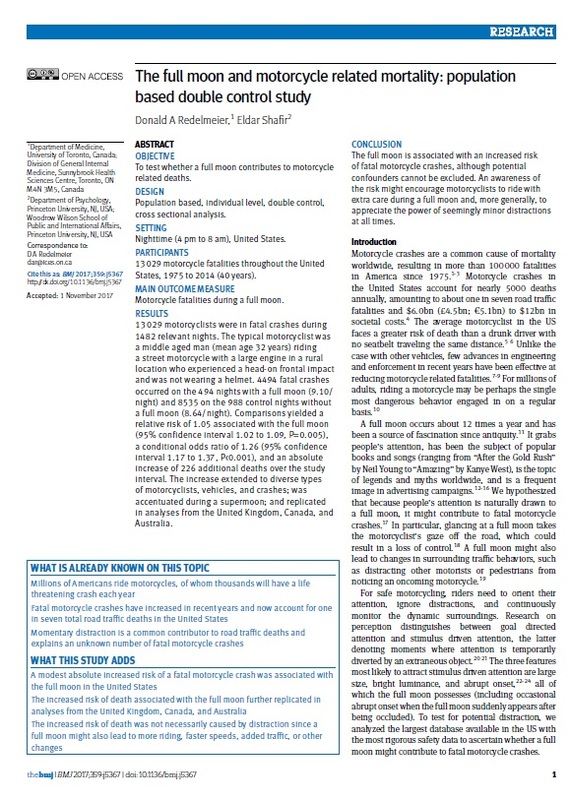 Click the image below or the following link to see the full-length paper: “The full moon and motorcycle related mortality: population based double control study“.